The center of Kiev has been transformed into a battleground as rioters clash with police on Independence Square. RT has gathered the twelve most horrifying videos that show Kiev’s descent into turmoil. Ukraine has seen some of the worst scenes of violence over the last few days, with over 60 dead and over 500 injured in the escalating conflict. 1. An exclusive drone video shot by the Ruptly agency, captures a dizzying aerial view of burning Maidan on Wednesday. Massive clouds of black smoke rise from the barricades set ablaze by rioters on Independence Square. 2.An explosion goes off near an injured policeman as a fellow officer tries to help him. Police are pulling back, covering their retreat with live rounds. 3. The raging fires are non-stop on Independence Square, which looks like a veritable warzone. The footage shows surreal scenes on the frontline as the ceasefire falls. 4. Armed rioters dressed in body armor and helmets use a make-shift catapult to launch Molotov cocktails at security forces. 5. A berserk mob waylays officers, attacking them with stones and sticks, forcing them to retreat. The advancing crowd single out a police officer, surround him and ruthlessly beat him to the ground. 6. 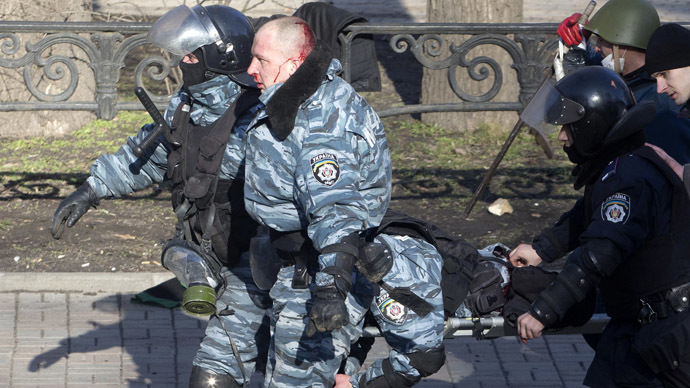 Police captured by rioters are seen being frog marched through the center of Kiev. 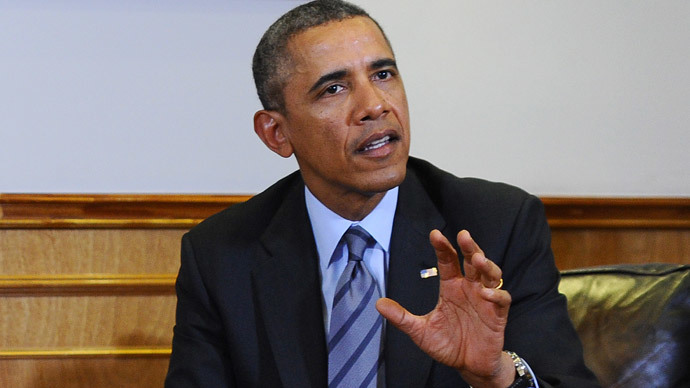 Medical teams struggle to administer emergency aid to people wounded in the violent conflict. 7. The lobby of the Ukraine Hotel has been turned into a field hospital by the unrest. A seriously injured man grips a priest’s hand as he is tended by medics, while volunteers bring in bodies of the wounded on make-shift stretchers. (WARNING: GRAPHIC). 8. The bodies of the conflict’s victims line Kiev’s central streets, some covered by only a plastic sheet. 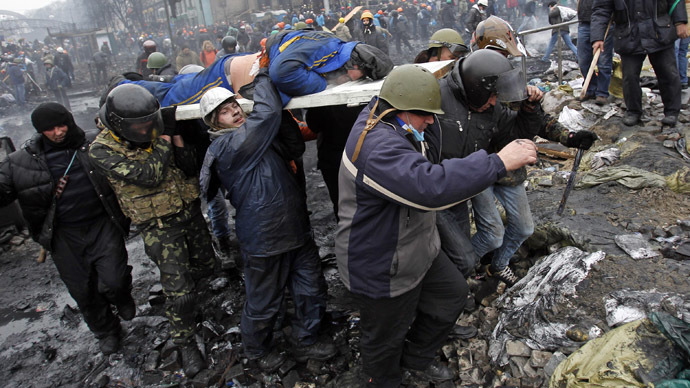 Dozens of lives have already been claimed by the growing unrest in the Ukrainian capital. (WARNING: GRAPHIC). 9. 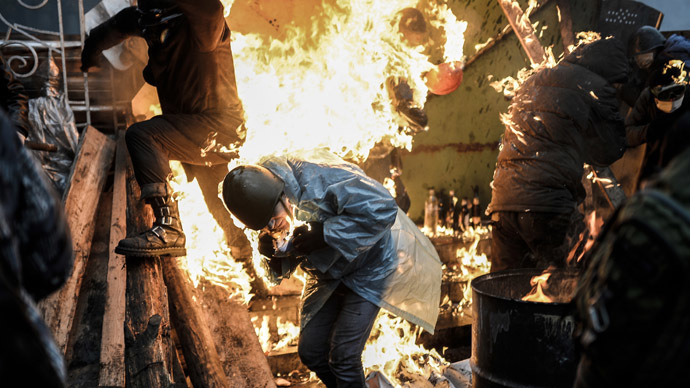 Mostly using stones dug up from the streets of Kiev, rioters employ everything at their disposal to attack the police including Molotov cocktails, pellet guns, iron batons, pistols/hand guns. 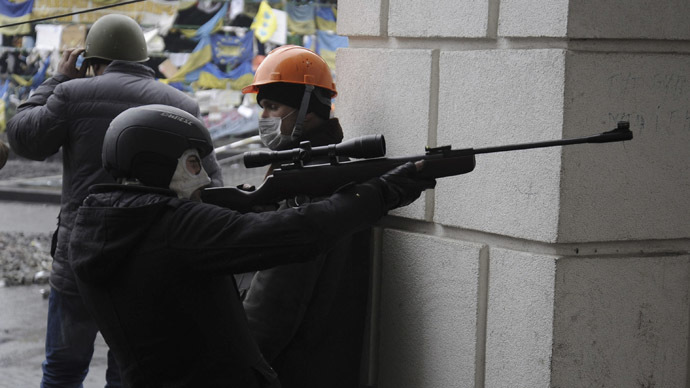 10.Ukrainian authorities have given officers permission to use live rounds in self-defense in the center of Kiev. Their decision follows reports that snipers stationed on buildings around Independence Square shot and injured over 20 police on Thursday morning. 11. Journalists filmed a group of people under fire during Thursday’s battles. Using shields for cover, protesters fell to the ground after being shot at from different directions and were then dragged away for medical help. The truce struck between the Ukrainian President and opposition leaders was left in tatters on Thursday, as rioters began a renewed offensive, driving police from Independence Square.